With as many as six Rio Olympic bound shooters in the fold, India are expected to clinch most of the gold medals on offer when the event kick starts in the 12th South Asian Games on Wednesday. The 29-member Indian team, which features Olympic medallists Gagan Narang and Vijay Kumar among others, is the most star-studded team in the Games and is expected to walk away with almost all the 13 gold medals at the Kahilipara Shooting Range. Apart from Narang, other Rio-bound shooters in the squad include Chain Singh, Prakash Nanjappa, Gurpreet Singh, Apurvi Chandela and Heena Sidhu. Gagan and Chain are participating in all three rifle events and both are expected to win most of the medals up for grabs. The quality of competition is also expected to play a part in India’s expected dominance. The Indian shooters are way ahead of competition in South Asia and it would be nothing short of a shock if they flounder in what seems to be a stroll in the park awaiting them. Speaking of competition, Bangladesh had done well in the 2010 Games but they failed to build on that in the last six years and are not expected to give any stiff fight to the Indians. Even in 2010, India dominated both the men’s and women’s events, bagging 19 out of 22 gold medals along with 8 silver medals. Bangladesh had won the remaining 3 gold medals with 6 silvers. It is unlikely to be any different this time as well despite the home side missing some big names. The prominent shooters missing from the Indian team are Abhinav Bindra, who has already started preparing for the Olympics with his training and competition stints in Europe, and Asian Games gold-medallist and World Championship silver- medallist Jitu Rai, who has also sought to preserve himself for the bigger challenges ahead. The team, however, does feature pistol ace Samaresh Jung along with his wife Anuja Jung. Many of the Indians in fray are fresh from a reasonably good performance in the Asian Olympics Qualification event in New Delhi last month and they would look to continue the impressive form here as well. Tomorrow, Om Prakash, Prakash Nanjappa and Omkar Singh will be seen in action in the Men’s 50m pistol event. 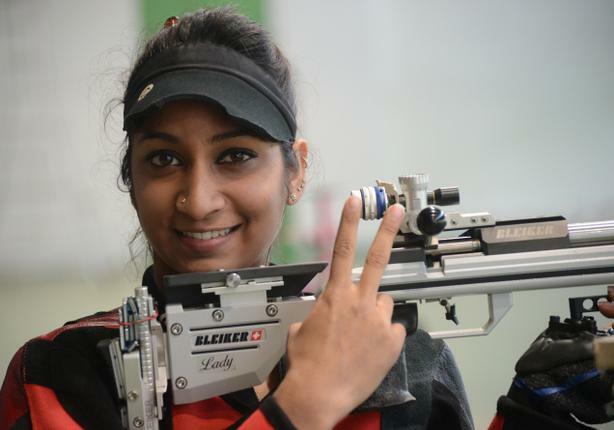 In the Women’s 10m Air Rifle, Apurvi Chandela, Pooja Ghatkar and Elizabeth Susan Koshy, who narrowly missed a Rio Olympics berth in New Delhi last month, will be taking aim.